Advanced Aircraft Training Blog | The 68th EAMTC: What we got up to! Here are some highlights of our time at the European Aviation Maintenance Training Committee Conference (EAMTC) in April. 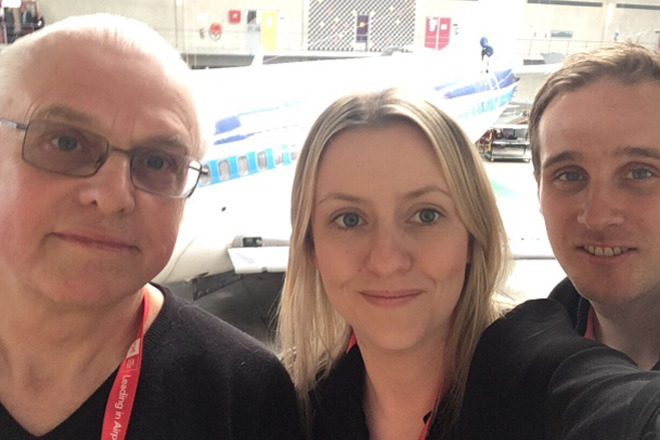 AAT Training Manager, Nick accompanied by our Course Manager, Laura and Quality Manager, David joined 157 other participants at last month's EAMTC in Amsterdam, Haarlem where they enjoyed two informative days learning about updates in the aviation industry. Information about new training technologies was high on the agenda and included a visit to the Regional Training Centre of Amsterdam (ROCvA) - a perfect opportunity for the team to see (and try out!) the latest Halo technology. Following a packed agenda that included presentations and workshops, everyone was treated to an evening river cruise around Amsterdam at the end of day one. On the second and final day of the conference, all listened to an interesting talk by Neil Williams, Head of Training Delivery at Resource Group, UK which focused on exam security. This was rounded off with a tour around the ROC Training Facility where the team was lucky enough to experience the methods used to train their students. Our Course Manager, Laura can be seen trying out the latest virtual reality technology using HoloLens in the image below. As always, AAT enjoyed catching up with friends from Lufthansa Shannon, FL Technics, Eithad and Air Europa and we look forward to the next planned EAMTC later in the year.